← A new day dawns, with two left feet. 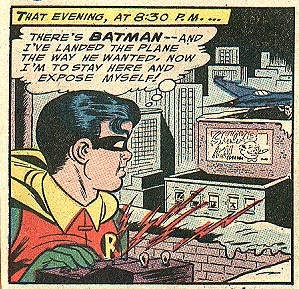 Random Panel: Holy Inane Bat-Plans, Batman! 7 Responses to Random Panel: Holy Inane Bat-Plans, Batman! The next panel the OnomontoPOWia will be “WANG”. Will Robin expose the Grayson family jewels? Will Batman be arrested for exploiting a minor and crimes against nature? Tune in tomorrow, same bat time, same bat channel! I’m fairly certain that’s *exactly* the kind of thing of which Dr. Wertham would disapprove. “landed the plane”, is that what they were calling it back then? Personally, I like the fact that Batman wanted him to land the Batplane diagonally on a roof that’s unlikely to support it’s weight at rest, much less whatever it does to take off from there! I’m behind the curve here, but wanted to say this is one of the best ever. Thank you.